“I was born and raised in Parkland. The daycare next door is actually the first daycare I went to. My mother’s first apartment is around the corner on Olive St. My grandmother still lives on the other side of Olive, so I was raised down here. About four or five years ago, I was in real estate, trying to find some properties to flip. A young man, who was property manager at the time, of all of these complexes, actually came and told me that he didn’t have any properties for me but the community needed a laundromat. I didn’t know nothing about laundromat. 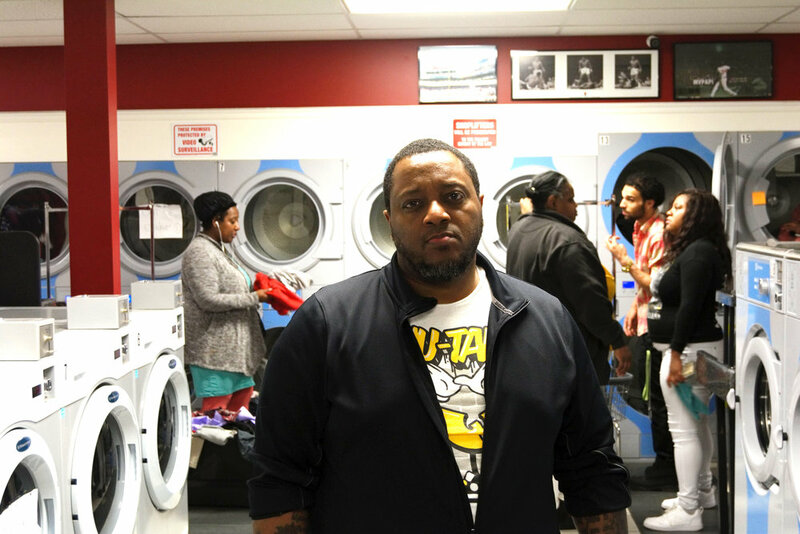 At the time, with funding, it was very expensive for a laundromat. With the out builds and the machines, it’s about $500K. So, at the time, I couldn’t do it. Unfortunately, in December 2014, my mother passed away in a tragic accident. Metro didn’t see her crossing the street and hit my mother. She survived that for about 10-15 days and had eight surgeries. Of course the city had to pay. That was the second person they killed in three years but you know, God is still blessing us. Funds came and then the laundromat. April 10th will be our actual one year anniversary. We’re striving and trying to do better. I was born and raised here, so I’m doing what I can while I can. For years, my dream was for 18th St. to become like Bardstown Rd. I wanna see businesses after businesses, that’s a huge dream. I actually did a background check on Parkland. There used to be a bunch of businesses but the 1960s riot tore it up. The West End is different from the east and the south. We got a lot of poverty. I would love to see it back to where it was. The houses are beautiful. I love the houses. If I can transform Parkland into what I’d love to see everyday, I would do it. I’m interested in buying that lot across the street and put a miniature park there. We need a library, with 25,000 square feet, there’s plenty of room for a library. We also need a senior center and an actual center for the kids. In this neighborhood, there’s only four daycares. There’s a lot of kids in the neighborhood. We see around 100-200 kids a day, in the neighborhood and they have nothing to do. We’re constantly putting kids out of here, because you can’t hang out in the laundromat and they’re looking for something to do. They need somewhere where they can be constructive and do some good within the community. We’ll get all of that going, you know? We’re gonna have some financial issues, but I know investors that want to give back. The kids inspire me. I was the youth minister for about four or five years at West End Baptist and at other churches. I’ve always been a kid person. I see kids around here and they need more. We’re not providing anything for them in Parkland and it’s a huge neighborhood. We have a lot of kids and there’s nothing for them to do. When you have nothing to do, you find something to do. Unfortunately, we had two killings here in the last year, one here in the alley, behind me and the other was a kid who was dumped out here. That kid was a teenager and the man from the alley was about 24 or 25. My wife actually saw the body. We need to do something. We have a lot of activity going on and we need to make sure that the kids are safe. They can’t be safe if they have nothing to do. My advice to anyone wanting to start a business is to take your time. A lot of people want to start a business and will not take their time. Starting a business is not easy, especially a store front. You have to realize that you will have expenses. The overhead will destroy a business. We made sure that the overhead is steady. There’s plenty places that will help you start your business. The Nia Center will help you get your business plan together. Everyday, you have to do something. Take your time and don’t rush it.